Renovating a bathroom isn’t a simple process and it often creates a whole lot of questions. If you have a house with three bedrooms or more, most people would recommend a bath be included in your bathroom design. 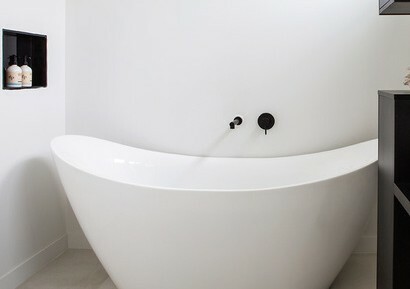 Most families have a preference for a bath, and it adds an element of luxury to your bathroom. If you can’t fit in a bath and a shower separately, then the shower-over-bath combination is a great option. Many bathrooms simply aren’t big enough for a bath though; if this is the case, then a shower with a removable showerhead is important for functionality. If you have the room, it is always a good idea to have a separate toilet. When you are renovating you may have some nooks or small spaces that don’t serve a purpose, and which you can turn into a separate toilet. If you don’t have the space or want to get rid of your separate toilet in order to steal extra space for your bathroom, then you are at no disadvantage; most homes do not have a separate toilet. Tiling does look stunning in the bathroom, but it comes with a price tag attached. While tiles range in price and quality and can be found at affordable prices, the key reason for the cost is the additional trades involved. Waterproofers, tilers, builders to level out the floors and potentially install under-floor heating, may all be required to complete this. If this isn’t an option, there are some great vinyl flooring alternatives that you can use instead, just make sure they are suitable for wet areas. Adding colour is about creating a restful space that complements your design. Leaning towards greys, blues and greens in your bathroom means colour won’t overwhelm the space. If you don’t want colour on your walls, there are so many other options to bring in colour; the tapware, accessories such as towels and candles, or even artwork and plants. The most common reason to have lighting over the mirror in a bathroom is to make it easy to put on make-up. But realistically, most people don’t put their make-up on in their bathroom, and natural light is the best lighting to use anyway. So before adding task lighting, consider whether there is a task you will do that needs extra light. If not, you don’t need task lighting and you have saved yourself some money and time. That said, general lighting is important within a bathroom. Think about selecting strong lighting such as downlights so you can have a lot of light reaching most areas. Achieving a stunning design statement in the bathroom is best achieved through the vanity; it’s a safe place to draw the eye and there are vast design options available to suit just about any style. Consider investing in a designer vanity – there are some incredible pieces available if you know where to look. Matching a vanity with an eye-catching mirror will amplify the effect of the vanity.